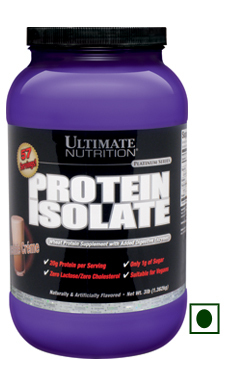 Introducing Ultimate Nutrition Protein Isolate, a new wheat based protein shake! Protein is one of the most important supplements for all athletes, but it is especially indispensable for those involved in long-term, high intensity endurance training. It is the fuel for the build-up, mass and toning of the muscle. In fact, protein is essential for growth and development. Wheat protein offers all the benefits of dairy based proteins without any of the lactose and cholesterol. Additionally, it is suitable for use by vegan athletes. Wheat protein also offers a higher Glutamic Acid level than many comparable dairy based protein shakes. Ultimate Nutrition Protein Isolate is fortified with digestive enzymes for optimal nutrient absorption and offers many benefits: 20g protein per serving Added digestive enzymes Only 1 g of sugar per serving Zero lactose and zero cholesterol Suitable for vegans and the lactose intolerant Ultimate Nutrition utilizes only the highest-grade wheat protein isolate. Due to its unique high glutamic acid/glutamine content, interest in wheat protein is on the rise. During times of physical stress, glutamine reserves are depleted and need to be replenished through supplementation. Weightlifters and bodybuilders realize that glutamine is critical for muscle building because it is a nitrogen donor, meaning that it moves the nitrogen around in the body to where it is needed. Anyone that pushes the iron understands that a positive nitrogen balance is necessary criteria in the effort to gain muscle mass. Glutamine is the ultimate anti-catabolic preventing muscle wasting which lessens the degree of muscle damage and soreness. It helps the body to secrete its own growth hormone which trigger's the release of IGF-1 (Insulin Growth Factor 1). This hormone helps promote weight loss, increase lean body mass, and increase bone density. Also, it neutralizes lactic acid burn in your muscles by releasing Plasma Bicarbonate allowing you to work out longer and. Ultimate Nutrition Protein Isolate is available in Vanilla Crème and Chocolate Crème 3lb (57 serving) containers. Protein Isolate is beneficial to athletes, bodybuilders, and anyone looking to improve their overall health through a healthy diet. 1. Who benefits from protein? Protein is an important nutrient needed by everyone of a daily basis. It is made up of essential and non-essential amino acids, which are the "building blocks" for healthy bodies. Protein has a number of different roles in the body including repairing body cells, building and repairing muscles and bones, providing a source of energy, and controling many of the important processes in the body related to metabolism. Wheat protein offers all the benefits of dairy based proteins without any of the lactose and cholesterol. Additionally, it is suitable for use by vegan athletes. Wheat protein also offers a higher Glutamic Acid level than many comparable dairy based protein shakes. 2. Why are branched-chain amino acids (BCAAs) important to athletes? BCAAs are unique because they can provide an energy source to muscles during endurance exercise. They are metabolized directly by skeletal muscles during prolonged exercise, while other amino acids are metabolized in the liver. Numerous studies have demonstrated that BCAAs improve protein synthesis and reverse overnight muscle tissue catabolism. 3. Whey proteins contain the highest concentration of the branched-chain amino acids—leucine, isoleucine and valine available from any protein source. Can enzymes be taken with other nutritional supplements?